On the perimeter: 'Wa man yabtaghi ghair al-islam dina falan yoqbala minhou wa houa fi al-akhirati min al-khassirine' (Whoever sighs after a religion other than Islam, it will never be accepted of him and in the last life he will be amongst those who have lost – Qur'an, III, 85). At the centre, the text consists of five lines: 'La illah ila Allah / Muhammad rassoul Allah / amir al-muslimine Ali bin / Yusuf walie ahdih / al-amir Tashufin' (Of the divine there is only God, Muhammad is the Messenger of God. The prince of the Muslims, Ali ibn Yusuf, who is the successor of the prince Tashufin). On the perimeter: 'Bism Allah doriba hadha al-dainar bil-maria sanat sabu wa thalathine wa khamsimiya' (In the name of God, this dinar was stamped in Almería in the year 537 [AD 1142]). At the centre, the text consists of four lines: 'Al-imam / abdu / allah / amir al-Muminin' (The Imam Abdullah, prince of the believers). This coin was made during the reign of Ali ibn Yusuf (r. AH 500–37 / AD 1106–43) in Almería, Spain. 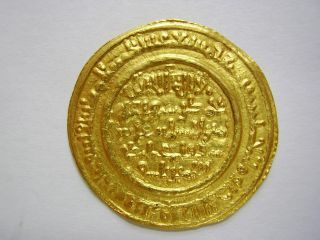 The existence of coin-making workshops in towns beyond the capital Marrakesh, such as Granada, Seville, Valencia and Tlemcen, testifies to the power, expansion and wealth of the Almoravids. 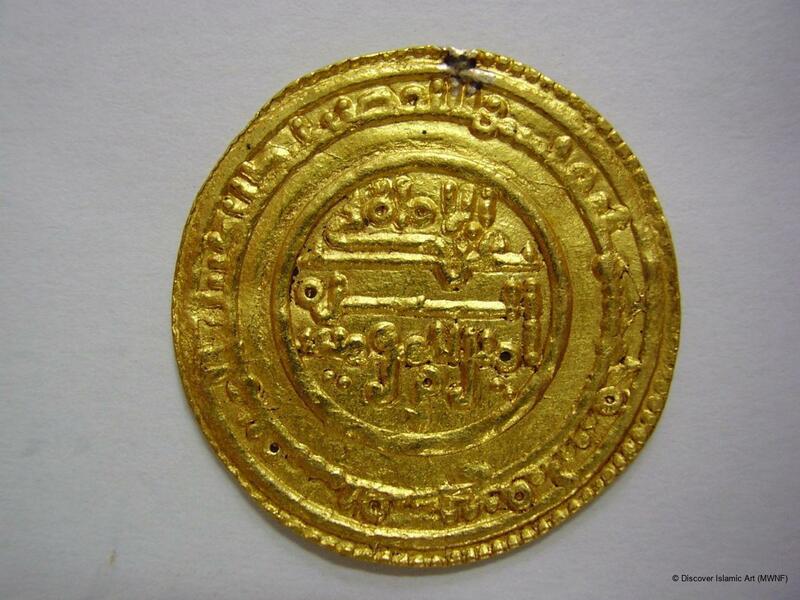 Generally speaking, these gold coins made under Ali ibn Yusuf are characterised by their purity, which varies from 76 to 96 per cent, and by the appearance of the title amir al-Muslimin (prince of Muslims). It should be noted that, in AH 495 / AD 1101, Yusuf ibn Tashufin proclaimed his son Ali as his successor to power. This dinar coin has kufic inscriptions on both faces and was minted during the reign of the Almoravid Ali ibn Yusuf in Almería, Spain. 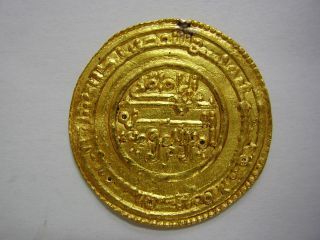 These coins are noteworthy for the purity of their gold and the inclusion of the title 'amir al-Muslimin' (prince of Muslims). The date of issue features on the coin. The town of issue (Almería, Spain) is indicated on the coin. Hazard, H. W., The Numismatic History of late Medieval North Africa, New York, 1952.